Once upon a laid back fishing village Kovalam is now an international beach wedding destination. The beach town is located by the Arabian Sea and is silhouetted by the giant palm trees and that’s what the name Kovalam literally translates to: the grove of coconut trees. Wikipedia Trivia: It is the only international beach in India. Located just 16kms away from Trivandrum the capital city, it is easily accessible. It has three beaches separated by rocky outcroppings in its coastline and together the three beaches Lighthouse, Hawa and Samudra make the crescent of Kovalam beach. While Lighthouse and Hawa are relatively touristy, outlined with shops, ayurvedic and yoga centres, shacks and restaurants, Samudra beach is more peaceful and quaint with upmarket resorts and restaurants. A beach wedding at one of the spectacular’s beach in God’s own country is forever a wonderful idea. Soft lighting, sound and sight of sea waves, an endless stretch of coconut trees, fresh flowers, delectable cuisine, traditional music, and dance, everything just comes together to make your wedding surreal. Understandably then, destination weddings are quite popular in Kovalam, Kerela. We have curated the list of only the very best of the Wedding Hotels in Kovalam for your Beach Destination Wedding in Kerala. Perched on a cliff with breathtaking sea views of Arabian Sea, Niraamaya Surya Samudra is set in acres of lush landscaped gardens with 31 wood cottages designed on the lines of heritage Keralite homes and equipped with all modern day comforts. The wellness resort is an enchanting spot to get married, if your guest list is somewhere under 100. Laid back was never so classy and stylish as it is at Niraamaya Kovalam. Take a dip in their infinity pool or lounge around in their verandah and see the endless dance of waves or book an appointment at their award winning spa that specializes in Ayurvedic Spa Therapies. You could plan a backwater cruise and beach picnic with your guests or may be a leisure afternoon high tea at their secluded Chandra beach or plan a day trip to Elephant Rehabilitation Centre and spend some time with these big fellas. A destination wedding in the barefoot luxurious natural environments of Niraamaya – Surya Samudra, Kovalam is bound to be a memorable experience for you and your dear ones. Perched on a rock face and is cradled between two wide beaches, The Leela Kovalam is easily one of the best venue for weddings in Kerala. Add to that the signature style Leela opulence and exceptional services, you really don’t have to look any further. The 182 rooms and suites are scattered over acres of verdant grounds and the Club rooms have private sundecks with uninterrupted views of the Arabian Sea, you and your guests would be spoiled rotten. The Pandhal is a rustic and charming hall with quintessential Kerala character and can accommodate up to 400 people, would be great for gala dinner. 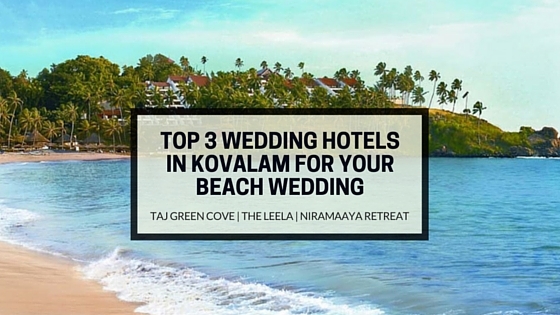 Did we mention it has its own private beach, so a beach wedding in God’s own country and a hotel property like Leela, we reckon the deal doesn’t need much selling? Vivanta by Taj, Green Cove is an extraordinary beach resort on Samudra Beach in Kovalam, stretched over acres of verdant land offering views of the Arabian Sea. Built on floating barges and anchored to the lagoon beside the beach, it offers luxurious interiors and private decks for sun bathing. The hillside resorts offers soothing vistas of backwaters, beaches and sea enveloped with coconut and green plantations. You and your guests are assured of an incredibly comfortable stay and coupled with Taj’s hospitality it would be just perfect. And how about taking your guests for houseboat ride meandering through the backwaters, which we need say would also make for great photographs. You could have an intimate pre/ post wedding ceremony at its Cabana Lawns while the main event could be organized at the Open-air sea facing lawns that can accommodate up to 600 people and gala dinner could be hosted at any of their charming banquet halls. We especially like the Agora Convention centre with an al fresco lawn area. A wedding in this serene hillside property overlooking the beach would be simply gorgeous, there’s no other way to it really. Luxurious properties, breathtaking views and natural settings, exceptional services, coastal culinary delights, these properties have all the ingredients for your gorgeous wedding by the beach. Get in touch with us and we would love to help you plan your wedding in the beach heaven Kovalam and style your wedding as such that it reflects the beautiful you and the beautiful Kerala.